Relaxing, eh better rephrase that, napping on the backporch on Sunday afternoon, I woke to sirens. Now sirens are a rather common disquieting sound in my neighborhood since I don't live far from one of the busiest north/south byways in our town. A spot where there are accidents and speeders aplenty, thus the sirens. But these sirens were loud and close and they kept coming. After I finally decided the need to investigate all the noise, I opened the front door and this is what awaited me. What the heck is going on. 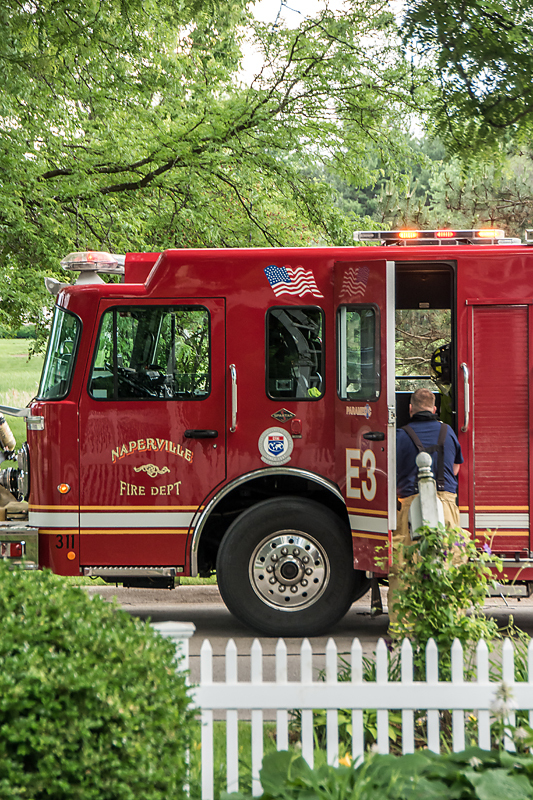 Ofcourse I grabbed my camera and out the front door I went, like all curious neighbors when firetrucks and ambulances are surrounding your neighborhood. I spied a few neighbors across the street, naturally I joined them and started in with the questions....what's happening. Apparently a house on the cul-de-sac, only about 4 houses from me, caught on fire. I did not know the neighbor, but the story goes that she had just remodeled the house from top to bottom. Oh my heart sank when I heard that, seeing the firemen with their hoses and axes doing their job, putting out the fire, but in-turn destroying the home and all the work you have just completed. 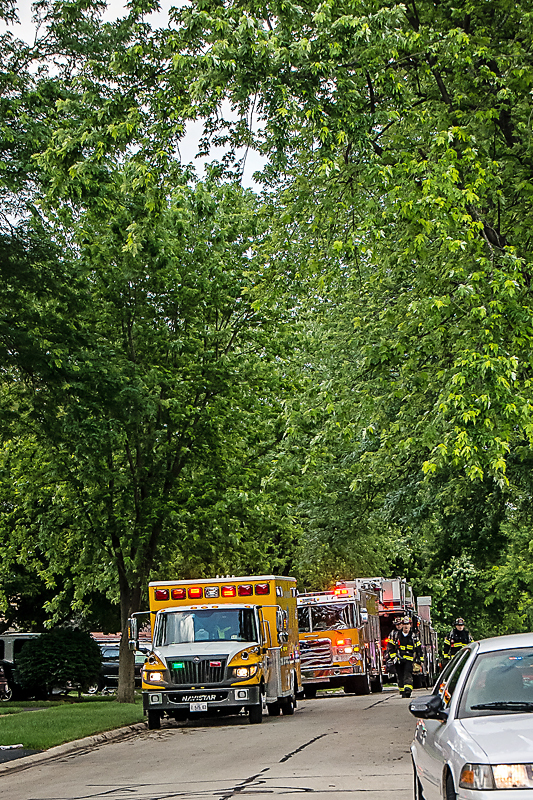 The fire was under control by the time I joined the neighbors, more smoke than fire, but....the pet dog was still inside. The hero of the day appeared with dog in hand handing her gently over to her owner. No one else was in the home and it was such a joy to see the owner and her sweet pup re-united. They gave her oxygen and very shortly thereafter she was walking and seemed perfectly fine. I am not sure what caused the fire, nor where exactly it started. But I do realize how quickly your home can be destroyed. About a month ago my clothes dryer which is on the 2nd floor, stopped putting out heat to dry. The dryer itself seemed to be in working order, just no heat. Calling the repairman I dreaded the worst, but what he found instead was a backed-up hose that leads from the outside to the back of the dryer. Stuffed and totally filled with sticks, feathers, cotton, snips of fabric, and a nest with 5 eggs in tack. The birds were using the hose as a heated place to build their nests. This is what was causing the "no heat". And then he warned me that this could have easily caused a massive fire with my gas dryer's open flame and all these dried sticks and twigs, a disaster waiting to happen. Oh boy, huge prayer of thanksgiving that I escaped this could-be disaster. So yes, fires can happen without us even knowing the cause. But I learned a valuable lesson and will now check and keep that hose clear. Be careful, be safe. Good reminder about fires and dryers! So happy no one was hurt in the fire near you. I appreciate the work that fire fighters do so much. And to go the extra mile for the dog is so wonderful! I know they do this often. Brave souls! We do tend to get too casual about these things, don't we? Thanks for the great reminder. And you be careful, too, my friend! Great shot of your neighbor giving her dog a hug. How awful that would be to have your home burn, and thank goodness you found all that lint in your dryer before disaster struck. A big fire hazard for sure! 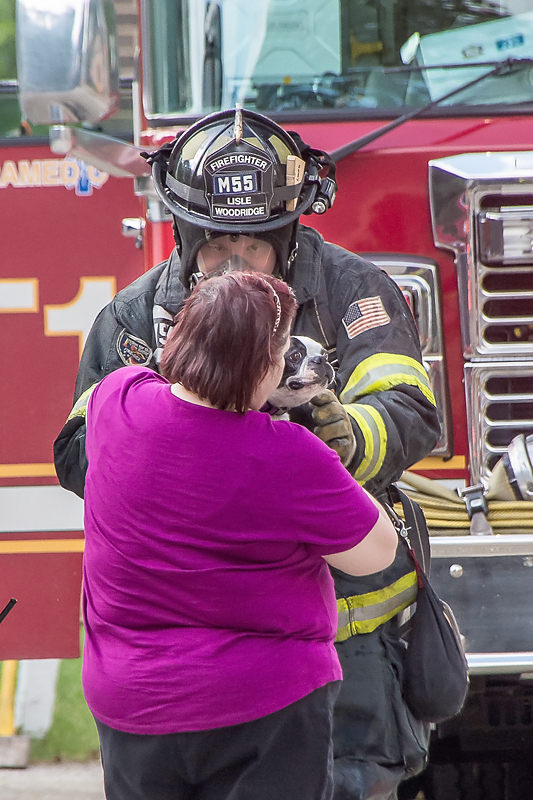 Aw--love that compassionate face on that first responder. Beautiful photo journalism! So glad the puppy and owner were reunited!!! Great shots and journalist-style story-telling ... so happy to hear that the lady and her dog are OK but sad about the house. Thank goodness you discovered your dryer hazard! Thank you for your Be Careful message . . . I will be checking my dryer vent/hoses STAT . . . Happy your neighbor has her rescued doggie in her arms! I guess I am not as weird as I thought, I check my dryer vent frequently. 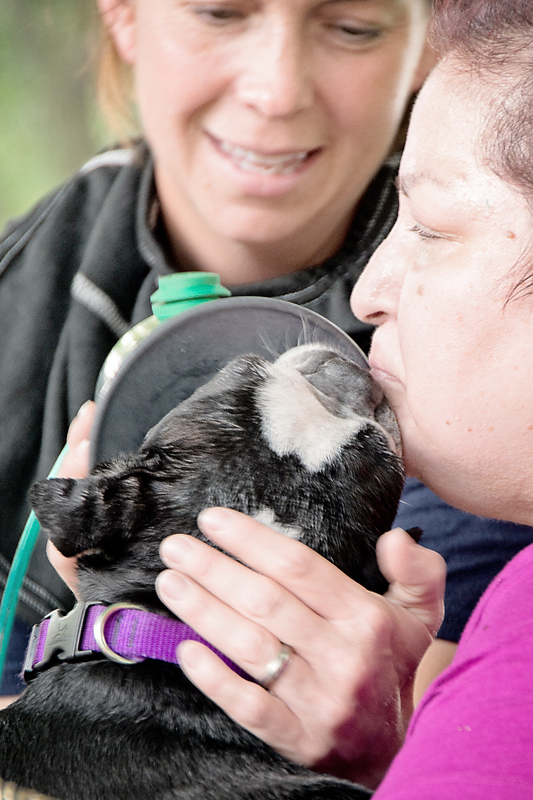 Your pictures of the neighbor with her Boston are heartwarming. Thanks for a very important lesson to be aware of. - So glad you did not have any damage done to your house. - I'm so sorry about your neighbors place but very thankful she and her sweet little dog were both safe. Goodness, what excitement. Fire would be awful - when we have a dry summer, I always worry about forest fires in our neighborhood. So far this spring, we've been very wet. The poor lady. I hope her house wasn't too badly damaged. Glad the little dog was rescued. Each spring and fall I check the outside vent from the dryer and run a clean wire through the tubing. Good friends of ours had the dryer catch fire years back - their dog was not so fortunate. The house didn't completely burn down, but they were uprooted for nearly a year. So glad your neighbor only suffered material damage and not that which can not be replaced.